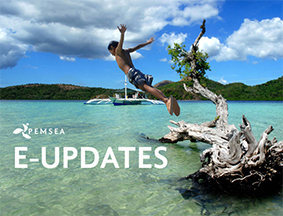 Welcome to the first e-update of 2019! Towards the end of 2018 our Sixth East Asian Seas Congress saw delegates from throughout the region and the world congregate in Iloilo City to discuss how to secure healthy and sustainable oceans, people, and economies, and how to move as one with the global ocean agenda. Many of the proceedings from that event are now available. Officially released during the Congress was our book Local Contributions to Global Sustainable Development Agenda: Case Studies in Integrated Coastal Management in the East Asian Seas Region. This contains case studies from throughout PEMSEA's 25 years. Read how two cases have improved ecosystem health. Following cleanup and rehabilitation efforts in Boracay, an ambitious attempt to clean Manila Bay was launched late this month by the Philippine Government, led by the Department of Environment and Natural Resources. Internationally, efforts to reduce pollution spurred the creation of the Alliance to End Plastic Waste, whose members are global companies from throughout the plastic supply chain. The importance of ensuring ocean use is sustainable was highlighted by China's huge increase in seafood consumptionduring 2018. Actions in the region to tackle illegal threats to biodiversity are having an impact, as China cracks a totoaba smuggling ring, while Indonesia looks to extend its anti-IUU fishing enforcement capabilities, and the Marine Stewardship Council works on potential changes to its fisheries evaluation such as taking into account shark finning. Research on the impact of climate change continues, with new research suggesting that as the oceans reach the end of its thermal buffering warming will increase and sea level will rise 30cm this century. Current pledges fall short of what is needed to meet the Paris Agreement. In light of the growing impact of climate change, the World Bank is increasing finance for climate resilience. Lessons can be learned from the Indonesian response to the Sunda Strait tsunami, which was carried out through pre-existing capacity.